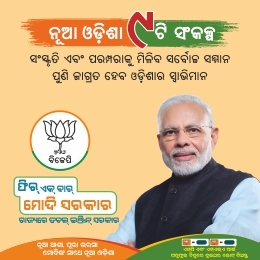 Bhubaneswar: There was plenty to cheer for fans at the Kalinga Stadium as India’s athletes clinched gold medals in the 400m and 1500m events in both the men’s and women’s races. Heavy showers disrupted the proceedings of the evening session on Day 2, but it wasn’t enough to stop the fans from cheering for the Indian athletes who responded in style on a day where 10 medal events were at stake, even as a major upset came about at the end of the evening in the men’s 100m final. India’s lead in the medal standings stayed put as they won four gold, two silver and two bronze medals to add to their tally on Day 1. The hosts now have six gold, three silver and six bronze medals overall. 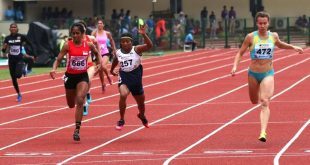 Nirmala Sheoran broke into the lead at the last turn and stayed there until the end under the unrelenting rain to take gold with a time of 52.01 seconds in the women’s 400m, while Quach Thi of Vietnam ended with the silver medal with 52.78. 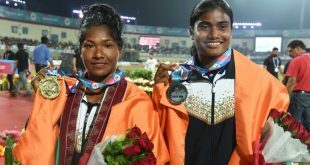 Jisna Mathew completed the medals by taking third place, while 2015 Asian Championships silver winner and Asian Games bronze medalist MR Poovamma finished just outside the medal standings. 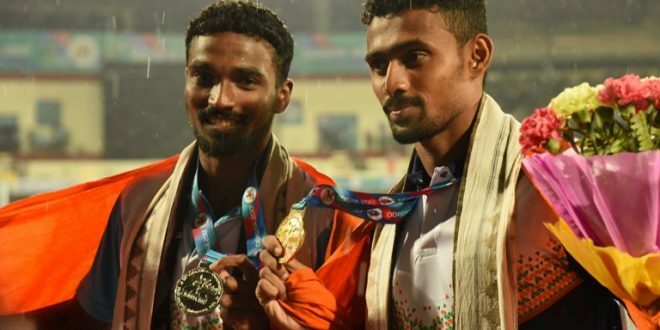 National champion Muhammad Anas, who broke the national record in the men’s 400m two months ago, emerged in the lead at the final turn and held off stiff competition from compatriot Rajiv Arokia to make it an Indian one-two in pouring rain. Anas finished with an impressive time of 45.77 seconds and Arokia took silver with 46.14 seconds, just ahead of Oman’s Ahmed Mubarak who settled for bronze. Just like Poovamma in the women’s 400m, Amoj Jacob also finished fourth, narrowly missing out on a bronze medal. Middle distance runner Ajay Kumar Saroj, however, caused a big upset in the men’s 1500m by beating Qatar’s Asian Games bronze medalist Jamal Hairane quite convincingly. Saroj clocked in an impressive 3:45.85 and finished over a second ahead of Hairane, while Iran’s Moslem Niadoost rounded off the medals by taking bronze. In the women’s 1500m, Chitra PU dominated the field after a spectacular flourish in the final lap and opened up a lead of more than a second over China’s Geng Min and Japan’s Ayako Jinnouchi, who got silver and bronze respectively. Ace Indian sprinter and local favourite Dutee Chand settled for bronze in the women’s 100m behind the Kazakhstan duo of ViktoriyaZyabkina and Olga Safronova, who clinched gold and silver respectively in an intense final. Zyabkina won her second gold in the 100m at the Asian Championships after winning it in Pune in 2013, while Incheon Asian Games gold medalist in the 200m, Safronova settled for second place. The men’s 100m final had a surprise in store as Hassan Taftian of Iran came from behind in the last half of the race to clinch gold by a hundredth of a second, ahead of defending champion Femi SeunOgunode of Qatar. Taftian finished with a time of 10.25 seconds to Ogunode’s 10.26, while Yang Chun-Han of Chinese Taipei claimed bronze in a tightly contested field. 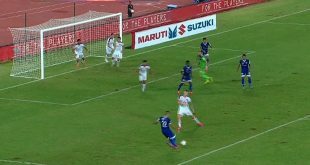 But there was more disappointment in store for Amiya Kumar Mallick, who was disqualified from the third semi-final of the men’s 100m after making a false start as it began to drizzle earlier in the evening. Mallick had been part of another disqualification in the morning session on Day 2, when he passed the baton exchange zone in the final turn of the men’4x100m semi-finals. There was more to cheer in the men’s shot put event, with youngster Tajinder Pal Singh Toor winning silver ahead of seniors Omprakash Singh Karhana and Jasdeep Singh Dhillon. China dominated the women’s shot put final with a gold and silver double, while in the women’s high jump, NadiyaDusanova of Uzbekistan won the gold medal, carrying on from compatriot Svetlana Radzivil who had won the gold in the same event last year. Thailand’s SuttisakSingkon won gold in the men’s decathlon after two days of gruelling competition saw him finish with a total of 7732 points, ahead of Japan’s Kazuya Kawasaki who won silver and last year’s silver medalist Guo Qi of China, who had to settle for the bronze medal this time.